Running With Brushes is a very personal challenge to us, on many levels. In 2013 our son joined the Rifles Regiment. Over his year of training at Sandhurst we became increasingly aware of how much dedication it takes to be a member of our armed forces. We wanted to do something meaningful and tangible to support him and his colleagues. We chose Care for Casualties as a charity we’d like to support. This project started as a crazy idea when I was doing my first open studio event. I had mounted some small paintings to show as part of my collection and they caught my eye. “Imagine if I could paint and sell 1000 of these entirely for the charity”, I thought. (My accounting brain did a quick calculation and came up with a lovely big number for the charity – £10000 is my goal). I ran the idea past a few friends. “Please tell me this is an insane idea.” They didn’t think it was. In fact, the general view was that it was a great idea – so now its a not-so-crazy idea. Running With Brushes emerged. I now have the challenge of painting 1000 watercolour images the same size. The count down begins. 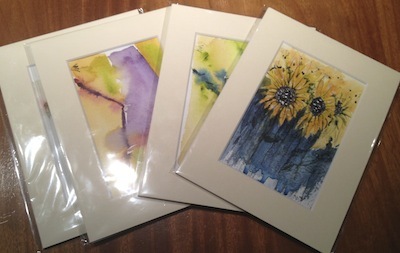 Every painting is a watercolour painted to the same size, and is mounted with an acid-free mount. All paintings sell for the same price – £15 plus P&P. The Care for Casualties Appeal is ring-fenced within The Rifles Regimental Trust specifically to care for those regimental families affected by the conflict in Iraq and Afghanistan. This includes direct and indirect support and grants to help individuals, on recuperation breaks, funeral support and casualty packs. Read the Care for Casualties website to find out more about the charity, the families it supports and the work it does. What goes to Care for Casualties? Care for Casualties will receive £15 for every painting sold (including Gift Aid). The balance of the total paid goes to cover the costs of mounting, packaging, postage and Paypal fees and taxes. The proceeds for each month’s sales on the website are transferred to the charity via JustGiving. Marc Massey is the person who does all the mounting and packaging of paintings. This is an ‘every little bit helps’ project. It’s a mountain being climbed one small step (painting) at a time, so no matter how small, every person supporting it makes a difference. View available paintings by artist or by tag using the links in the right hand navigation bar. Every one is an original so when it’s gone, it’s gone. If there’s a particular theme you would like painted, drop me a note and I will let you know what’s possible. We will mail paintings anywhere in the world, but please be aware that we use standard mail. If you want a painting sent tracked or insured, please let me know as there may be an additional charge. – Follow us on Facebook to see new paintings as they are completed and published. – Feedback. Comments and feedback are not only welcome, they are actively encouraged! I suspect I’ll need encouragement and motivation from time to time during this journey. Drop us an email for details of where paintings should be sent for inclusion in the project. Please ensure that have permission from the image originator for the work to be sold on RWB if you do wish to submit a painting done as part of a challenge or inspired by a painting done by another artist.